The Alfa Club Thailand has just gathered for its year-end meeting in Bangkok which was topped off by a special novelty in the shape of the arrival of a convoy of Alfa Romeos taking part in the Quest for the Silk Road. The Alfa Club Thailand has just gathered for its year-end meeting in Bangkok which was topped off by a special novelty in the shape of the arrival of a convoy of Alfa Romeos taking part in the AROC Quest the Silk Trail, a long-distance tour that kicked off in Singapore two days earlier and was busily trekking its way northwards to its final destination in Laos. It was typical hot and sunny December morning as the Alfa Romeos started to roll into the car park of the Bua Restaurant located on Srinakarin Road in the Prawet district of Bangkok, in the shadow of the squat concrete complex that is the Seri Center shopping mall. By 10:30 AM the car park was filling up with a mix of models, mostly historical, all immaculate and all sparking in the sunshine. 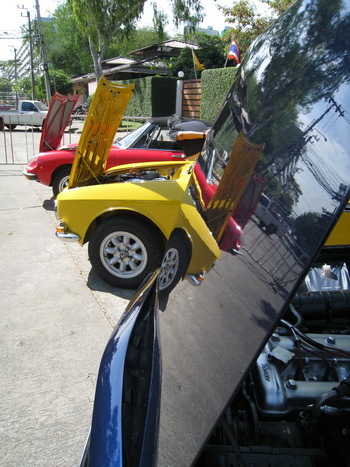 The level of restoration in Thailand is very high and all the cars on show were just as perfect as the day they had rolled off the production lines in Italy, most from the famous but now defunct Portello and Arese factories in Milan, the birth city of the brand birth that produced the cars that shaped the history of one of the world’s most evocative automotive names, as well a timeline that included Alfa Romeo’s current hub factory, Pomigliano d’Arco, near Naples and the hand-built low-volume lines of Pininfarina in Turin. The 1960s and 1970s were well represented by the a string of famous models, the Giulia Super, immortalised in the Italian job as the car the Italian police used to chase Michael Caine’s gang of Minis; and its numbers included a perfect version owned since new by the President of the Alfa Club Thailand, stretching through to the Giulia Nuova Super which ended the sedan’s timeline in the late 1970s, its gleaming silver bodywork clad with this final edition’s distinct black plastic appendages and flattened-out bonnet. A glorious Giulia Super racer, fitted with a 2-litre Twin Spark engine, also appeared; this beautiful machine was fresh from taking on a horde of BMW 3-series racers in the historic racing programe at the Bangsaen Thailand Speed Festival 2009 at the end of last month. And it was still bearing the decals. On the fenced-off streets of the Bangsaen resort, Thailand’s answer to the Macau races, this bright-white liveried Giulia Super won many new admirers. There were more elegant sedans of the era on show in the shape of the pretty 1750/2000 Berlina. 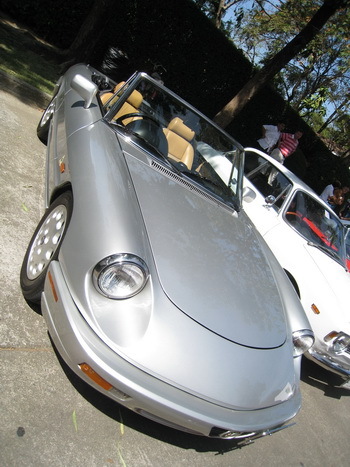 The much-loved Spider was also in evidence with examples from throughout its long lifecycle, from the earliest ‘boat tail’ to the final series 4 model that was rolled out in beginning of the 1990s as almost three decades of production of this iconic convertible finally ground to a halt. The 105 series Giulia coupe was also out in numbers as Bangkok has a strong and loyal following for these Bertone-designed cars. Moving through the 1970s and into early 1980s, a perfect GTV 2000 coupé and a jazzily-liveried sedan represented the Alfetta family. The Giulietta tag is set to be revived by Alfa Romeo next year for the long-awaited replacement for the C-segment Alfa 147, and here the last model to carry the famous name was also out in force, the sedan chasing through from series 1 to 3, including a very distinctive canary-yellow example. 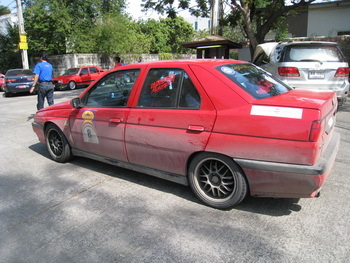 More recent models to turn up included the Alfa 156, a car which was briefly imported into Thailand in CKD kit form and assembled locally, meaning that these stylish sedans can be seen with reasonable regularity on the streets of a city where Italian cars usually a rare sight, while there was also a pair of 916 GTVs. An excellent buffet lunch was provided by the Bua Restaurant, providing the perfect opportunity to discuss the cars that everyone present shared a deep passion for, and to helpfully engage in the conversation out of the reach of the hot sun. The highlight of the day was the arrival immediately after lunch of the participants taking part in the AROC Quest the Silk Trail, an adventure that is involving members of the AROC Singapore, AROC Malaysia and Alfa Club Thailand, along with support from the regional agents, namely - EuroAutomobile Pte Ltd (Singapore), Sime Darby Auto Connexion (Malaysia) and Thai Prestige Ltd (Thailand). The tour started on December 18 with a long highway drive from Kuala Lumpur to Danok. Members from the AROC Singapore had a real crack of dawn start as they set off three hours earlier to rendezvous with the Malaysian owners in Kuala Lumpur for the official start. Sime Darby Auto Connexion hosted and sponsored this part of the event and the crews also took part in an Alfa Romeo Carnival Day that saw models from throughout the ages parading, while the convoy was flagged on its way northwards by the Italian Ambassador to Malaysia. The second day on the road saw the cars heading north through Thailand from Danok to the royal coastal resort of Hua Hin. And so while the Alfa Club Thailand members were serenely rolling into the Bua Restaurant, the cars that made up the Quest the Silk Trail column were pounding northwards once more, this time from Hua Hin, on a day that would see them continue, after this short Bangkok lunch stop, onwards to the Thailand-Laos border town of Nong Kahi. At times driving through Bangkok can be as much of a challenge as any back road in Laos, but eventually the convoy rolled into sight. 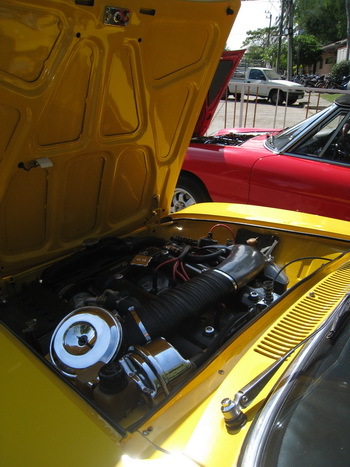 Two-and-a-half days into the trip and the Alfa Romeos were in caked in a sea of grime that bore evidence to the arduous trip they are making. 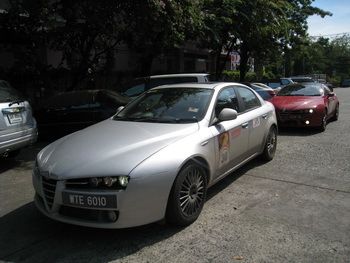 The Thailand, Singapore and Malaysian Alfa Romeo clubs’ are all closely linked and there was much enthusiasm all round. The enthusiasm of the tour members belied the long days of driving and short nights of sleep already under their belts and everyone was soon swapping stories, people from three Asian countries bound tightly together by a shared passion. The brightly decaled and mud-covered 17-car-strong convoy was made up of a swage of recent models, including the 159, 159 Sportwagon, Brera, 156, 164, GT Coupé and 155; and with a few problems that had been sorted out en route, the toughness of these Italian cars was really being put to the test, and so far it was all good. “It’s been a wonderful trip, we’ve done two days, we’ve still got one more night [in Thailand] then on to Vientiane for two days then back to Bangkok,” says Rashid Karyeo, the enthusiastic President of the Alfa Romeo Owners’ Club of Singapore, who is behind the wheel of a red Brera 3.2 V6 and is carrying diagnostic equipment with him; for sure this tour is well-prepared and highly organised. The AROC Malaysia President, Othman Zainal, is also on the tour – he’s driving a 166. With the lunch stop over, and with the ranks swelled by three members of the Alfa Club Thailand who were joining the tour, Ron Nathan, the capable and highly-organised tour leader, as well as being, by a considerably margin, the tallest man present, expertly marshaled everyone back to their cars and soon this dynamic adventure was rolling back onto the road, heading north out of Bangkok, and off to stretch sporty legs and put these Alfa Romeos over terrain that the designers at Alfa Romeo Centro Stile never envisioned.